Houston Chiropractor Dr. Gregory Johnson is recognized for his dedication in providing excellent chiropractic care and outstanding contribution to chiropractic profession. HOUSTON, TX, June 22, 2017 /24-7PressRelease/ — Houston Chiropractor Dr. Gregory Johnson has been named Doctor of the Year for Houston metropolitan district 11 by the Texas Chiropractic Association (TCA) at the annual convention held in Dallas, Texas last June 10, 2017 in appreciation of his outstanding contributions and dedication to the chiropractic profession. 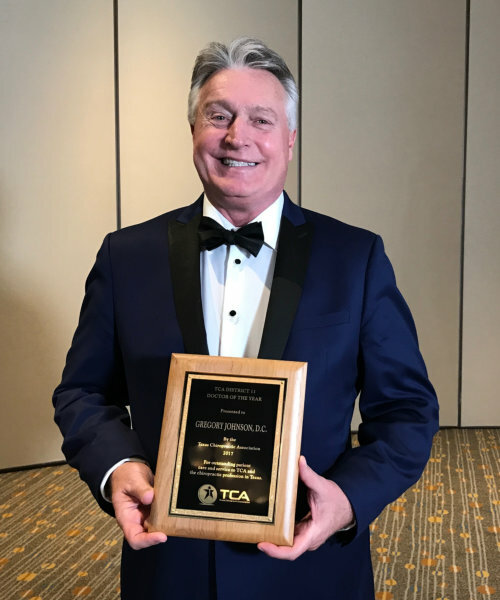 TCA’s annual awards are presented to outstanding members who have significantly contributed to the advancement of the chiropractic profession. Held at the Hyatt Regency in Dallas, the TCA awards celebrated chiropractors who demonstrate the principles of outstanding leadership and dedication to chiropractic. Recipients of the awards have made significant contributions that yield numerous benefits to the profession and the patients it serves. “All the hard work I have devoted in chiropractic care has helped thousands of patients restore their quality of life and get back on their feet without any need for surgical or medical intervention. I’m extremely grateful for the award and this inspires me to remain passionate in my profession and continue to help more people,” expressed Dr. Johnson, a graduate of the Palmer College of Chiropractic, the founding college of chiropractic, located in Davenport, Iowa. Chiropractic is widely recognized as a safe alternative and no-invasive treatment of mechanical disorders of the musculoskeletal system, especially the spine, which affects general health. Dr. Johnson, who established his practice in 1983, specializes in a technique known as BioPhysics and also utilizes Manual Spinal Decompression for the treatment of spinal disc problems such as Herniated Disc or Ruptured Disc, Bulged Disc, Degenerative Disc Disease or Osteoarthritis, Vertebral Subluxation, as well as Scoliosis. Dr. Johnson provides individualized chiropractic care tailored to each and every patient’s unique conditions. In recent years, Dr. Johnson has achieved success on his Youtube channel, Advanced Chiropractic Relief LLC. With over 1,200 video posts and 40,000 subscribers, his video posts on spinal manipulations or adjustments with actual patients are some of the most viewed chiropractic videos in social media. His video post Houston Oil Refinery Worker “Urban Cowboy Gets Adjusted for 1st Time had 32,280 views and his Ring Dinger of the Year video has racked up 619,707 views and 3,723 likes since its release in December 2016. People from all walks of life across the US and abroad travel to Houston seeking chiropractic care with Dr. Johnson for non-surgical treatment of disorders affecting the nervous system and/or musculoskeletal system, such as back pain, neck pain, joint pain of the arms or legs, headaches, and more. Advanced Chiropractic Relief provides comprehensive chiropractic care to address unique needs of patients who suffer from chronic back pain or spinal condition due to injury or degenerative disease. On your first visit, Dr. Johnson will explain how chiropractic care works and give you a full evaluation to see if chiropractic solutions are a good fit to address your health needs. At Advanced Chiropractic Relief, we customize chiropractic care based on your unique condition and health goals. For more information on chiropractic care or to schedule a consultation, visit www.AdvancedHoustonChiropractor.com or call (281) 405-2611. The Texas Chiropractic Association is the voice for chiropractic in Texas. It provides protection and state-wide advocacy for chiropractors. The association’s main goal is to provide guidance and assistance to TCA members to legally practice in Texas. Furthermore, the TCA promotes for Texas citizens to have adequate access to the health care of their choice and to ensure that chiropractors have suitable representation in the decision-making agencies of the government. The Chiro Texpo is a three-day convention that brings together chiropractic doctors, assistants and students and offers seminars, briefings and educational programs. It offers opportunities to meet with elected TCA officials and practitioners from across the state.